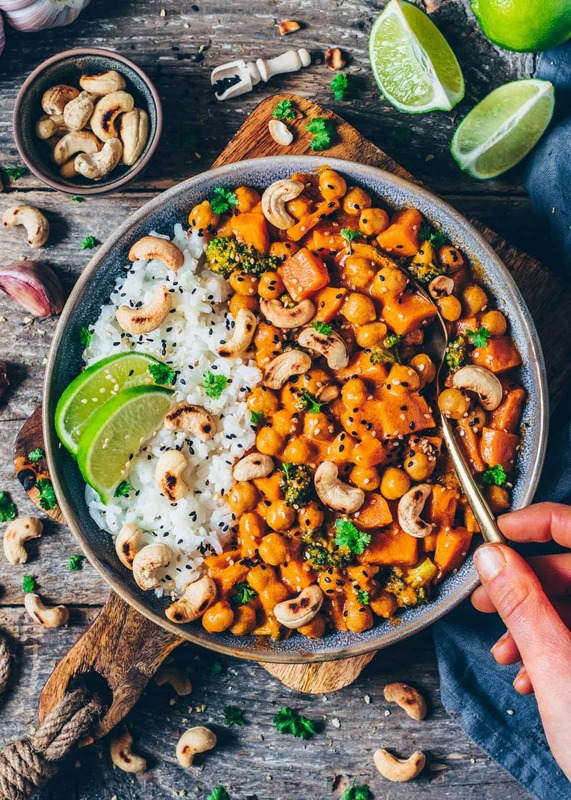 This creamy Sweet Potato, Chickpea and Coconut Curry with Broccoli is a comforting, healthy and nourishing meal that’s easy to make, vegan and SO delicious! It’s perfect for lunch or dinner and also a great meal Prep Recipe! What does comfort food mean to you? To me, there’s always a delicious creamy Curry that comes to mind when I think about something warm and Hearty. 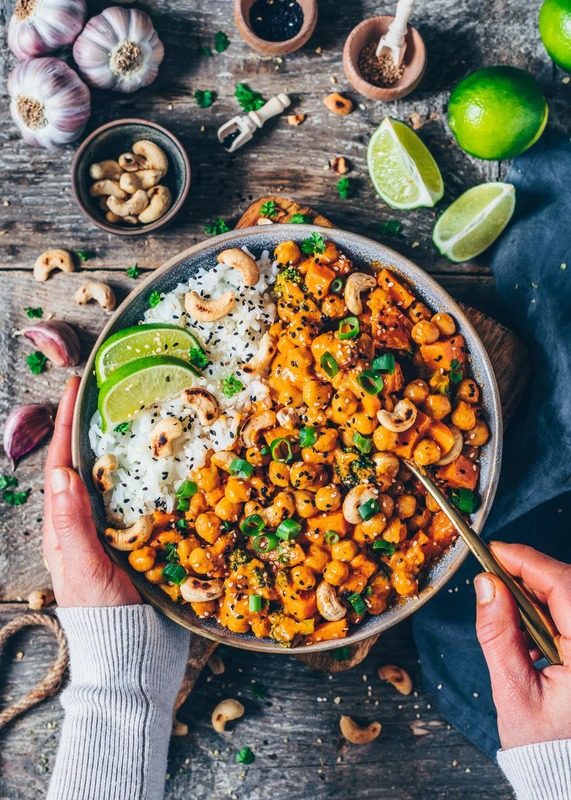 Even though I’ve already shared some Chickpea Curry Recipes here, I can’t get enough of this combination and I love creating new variations. Do you feel the same? 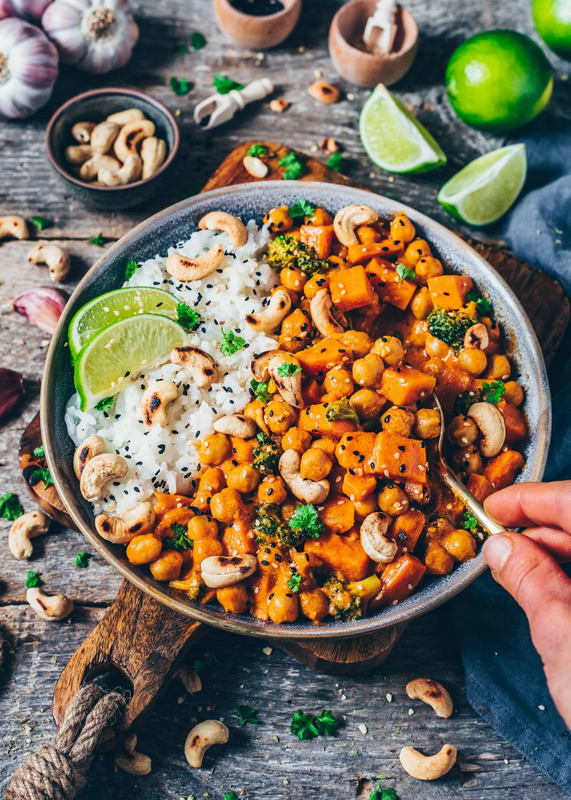 If so, this Sweet Potato Curry with Chickpeas could be your new favorite Recipe! 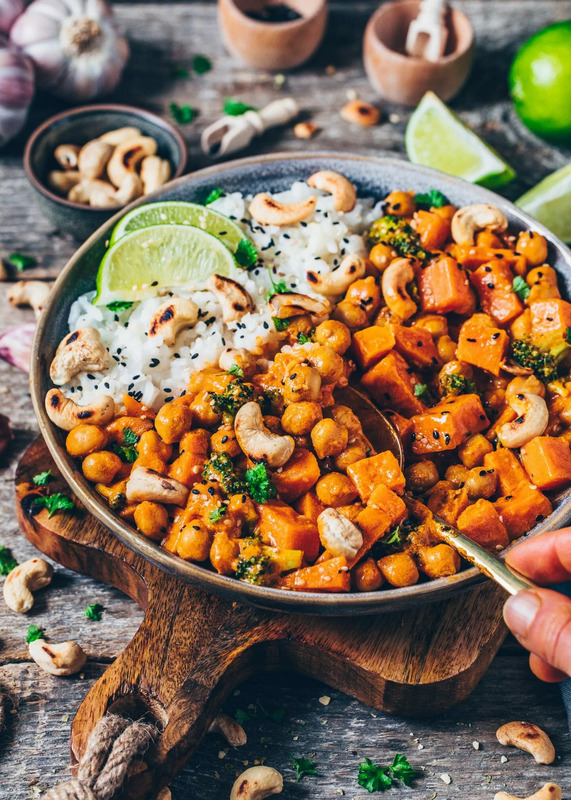 I’ve made this Sweet Potato Curry a couple of times already, and it’s always perfect, because, in contrast to my Pumpkin Chickpea Curry, Sweet Potatoes are in season all year round! There are basically no special ingredients that you have to buy super fresh on the same day. It’s totally okay to buy them a few days ahead of time and then store them covered in a cold dark room until you’re ready to use them. 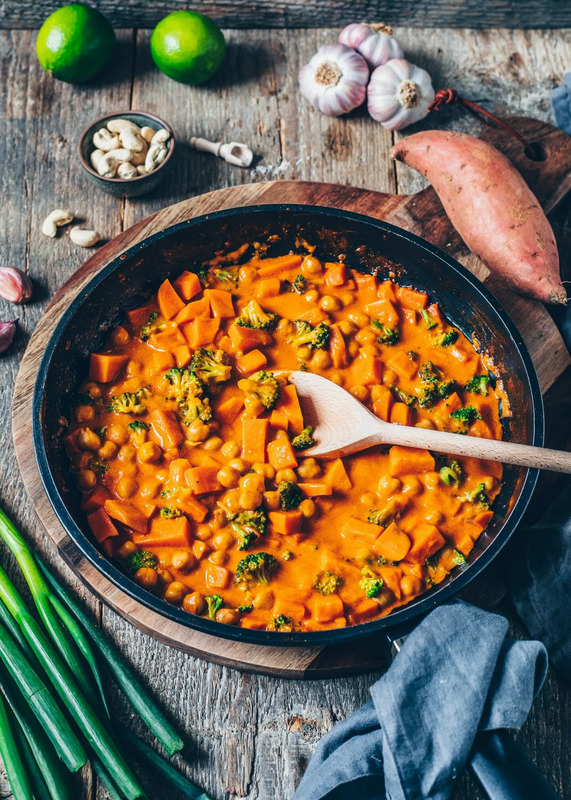 Besides the Sweet Potatoes (which are the main ingredient in this vegan Curry), I’ve also added other veggies such as carrots, broccoli, onions, and garlic, making it even more healthy and rich in vitamins and nutrients. And since I love to load my meals with additional plant-based protein, I’ve also added chickpeas. 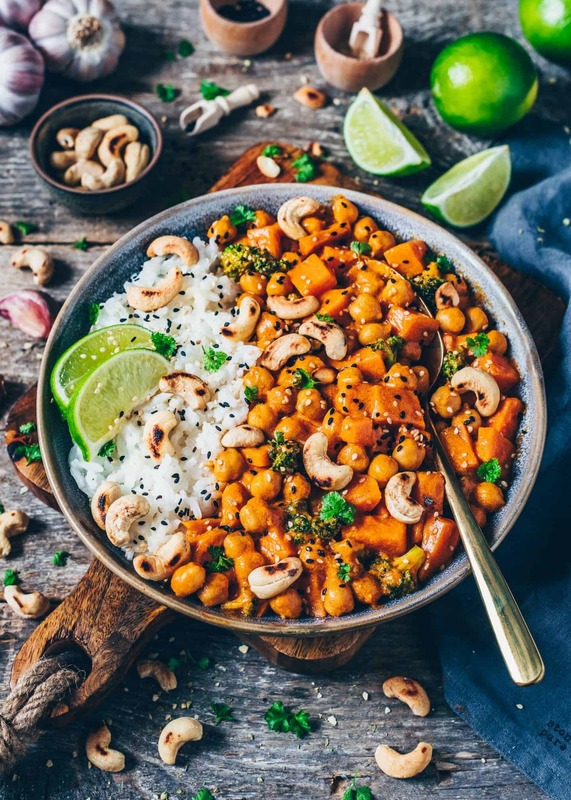 However, there are also other protein-rich plant-based ingredients, such as beans or tofu that you could add to this creamy Coconut Curry. Also, the vegetables can be swapped and mixed depending on your desired taste, or season. 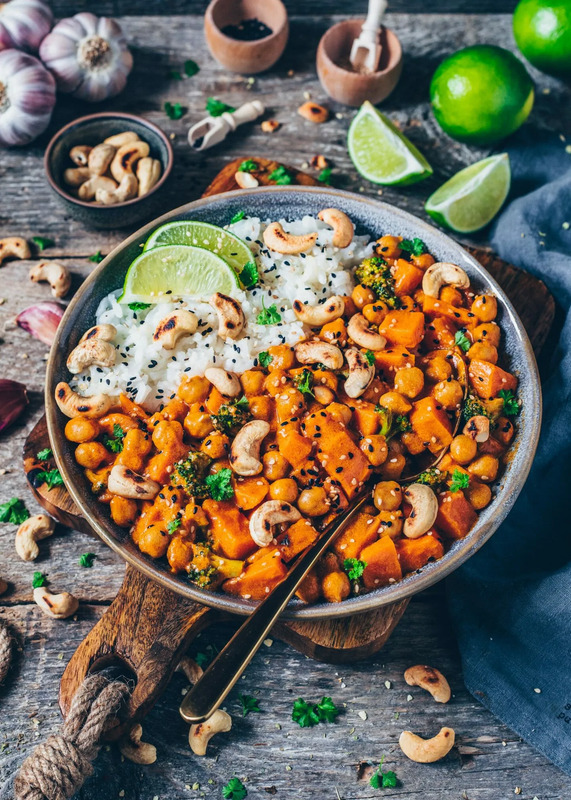 Making this Sweet Potato, Chickpea and Coconut Curry is super easy, and so, you don’t need any step-by-step pictures. Which means it’s also less work for me, haha! … Well, of course, that was just a little joke! 😃 I hope you know, that I will always do my best to explain and show you exactly what to do when cooking or baking my recipes. 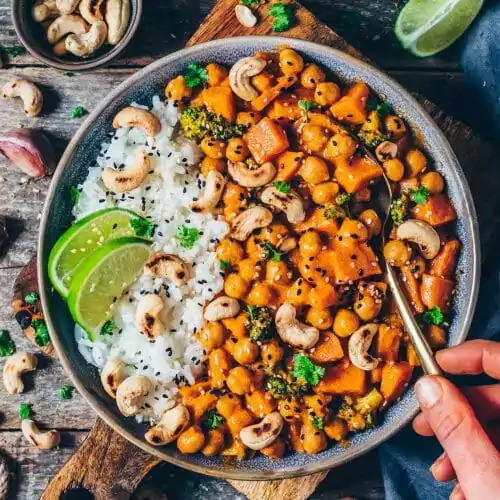 Anyways, this Vegan Chickpea Curry is really SOOOO easy to make, that just a few simple instructions should be enough. First, start with chopping your veggies and heat a bit of oil in a large skillet over medium heat. Then add the onions and roast for about 5 minutes (if using scallion, the cooking time will be only 1-2 minutes). Next, add the spices along with the garlic, stir to combine and fry for another minute to unfold flavors. Lastly, add coconut milk and strained tomatoes. Stir to combine again, cover the skillet and cook until done. 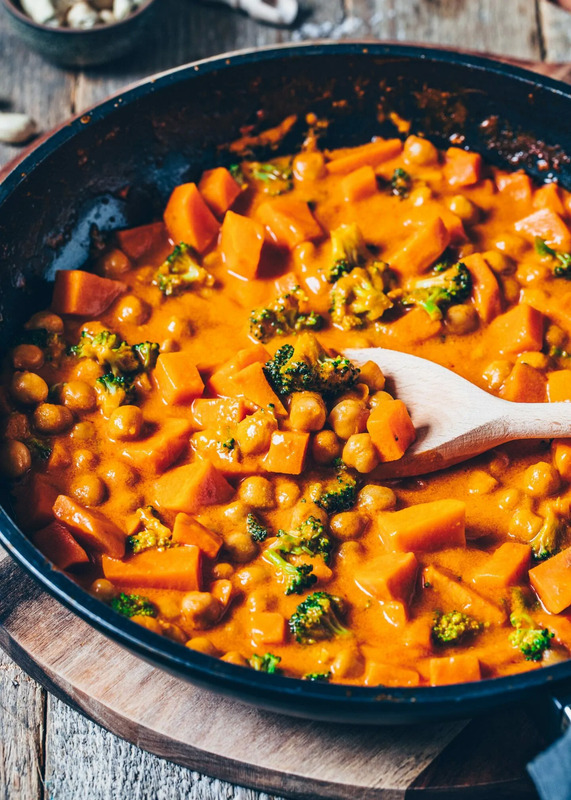 Just make sure to keep an eye on your Sweet Potato, Chickpea and Coconut Curry now and then, because you may need to add more liquid to thin if it’s getting too thick while cooking. To me, a creamy Coconut Curry must be served with rice, especially basmati rice because I find it has the BEST flavor and taste. While my Mom loves to serve Coconut Curry with rice noodles, bread or mashed potatoes, my Grandpa enjoys it with just simple cooked potatoes. For some reason, he doesn’t like rice, and he doesn’t like creamy mashed potatoes either. He always says that it alters the taste when adding anything else to cooked potatoes, haha! 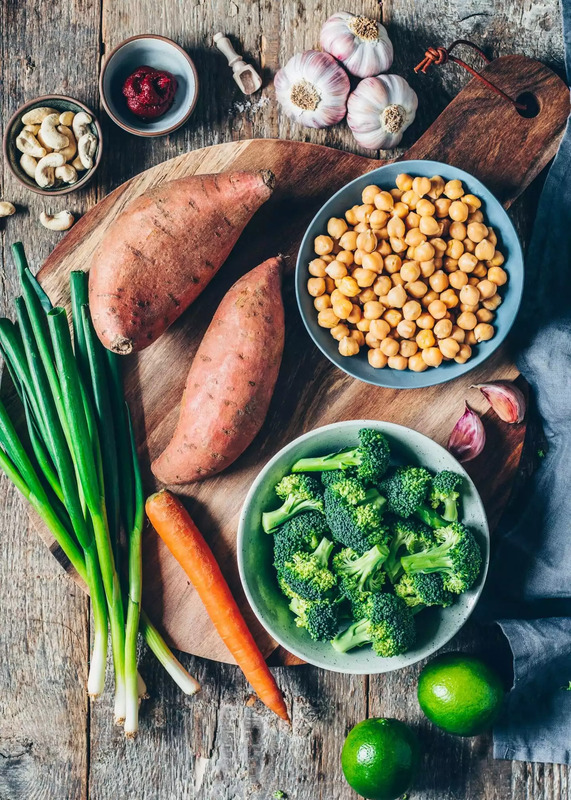 This recipe serves about 4-6 people and is also great for meal prep. 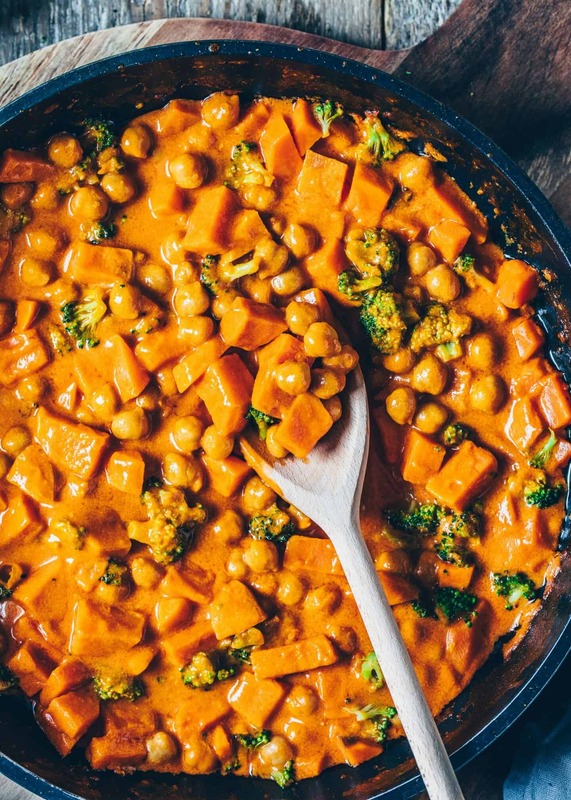 You can store leftover Sweet Potato Curry in a sealed container or lunch box in the fridge for up to 4 days. Then you can take it to work, university or school. You can also enjoy it the next day for a quick dinner or lunch. Another great option is to freeze it in a freezer box for longer. 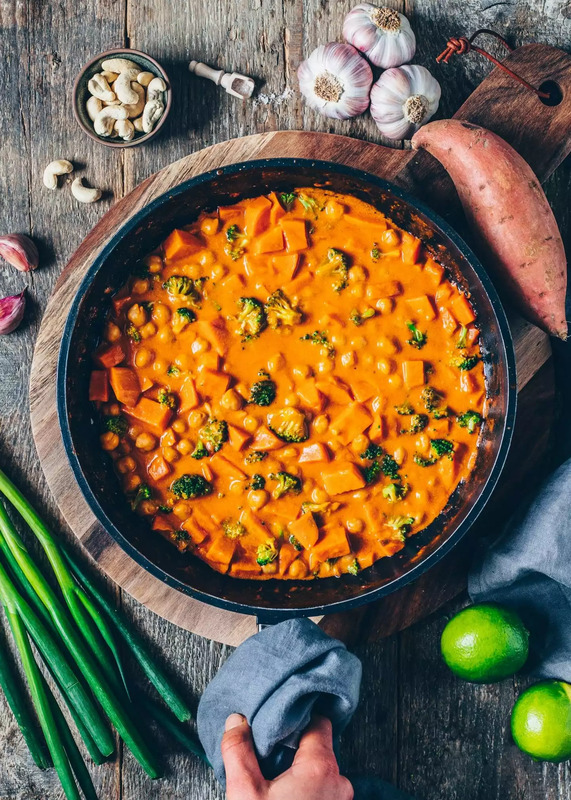 This creamy Sweet Potato, Chickpea and Coconut Curry with Broccoli is a comforting, healthy and nourishing meal that’s easy to make and SO delicious! It’s perfect for lunch or dinner and also a great meal Prep Recipe! In a large skillet or saucepan, heat the oil over medium heat. Add the onions and cook for 3-5 minutes, or until the onions are soft and translucent. (If using scallions, the cooking time will be only 1-2 minutes). Add the garlic, ginger, cumin, turmeric and curry paste. Stir to combine and sauté for a further 1/2 minute, until fragrant. Add the chopped sweet potato and carrot, stir to combine and roast for 1-2 minutes until lightly browned. Pour in strained tomatoes and coconut milk, stir to combine again. Cover the skillet, and cook over medium heat for about 10 minutes. Then add the broccoli florets and chickpeas and cook further 10 minutes, or until the veggies are fork-tender. (If the Curry thickens too much while cooking, add a bit of water). Season with salt and pepper to taste. Turn off the heat and set aside for 5 minutes or so to unfold flavors (optional). Serve your curry with cooked rice (or other grains/ bread). 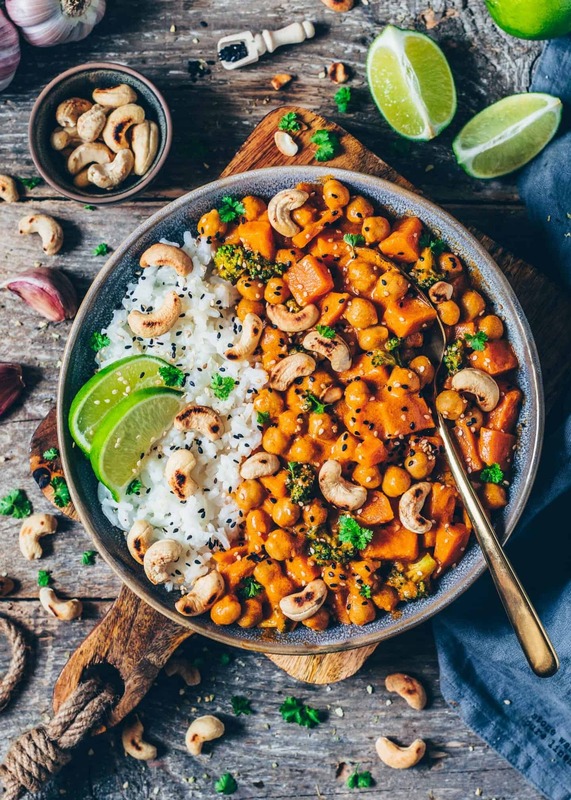 Garnish with toasted cashews, sesame seeds, fresh herbs (such as parsley, cilantro or scallions), and squeeze lime juice over it, if desired. I recommend chopping the sweet potatoes very small (into 1/4 -to 1/2 inch pieces) because they will cook faster this way. All curry pastes and powders vary in intensity and flavor, so adjust seasonings to taste. You can store leftover curry in a sealed container in the fridge for up to 4 days, or freeze for even longer. 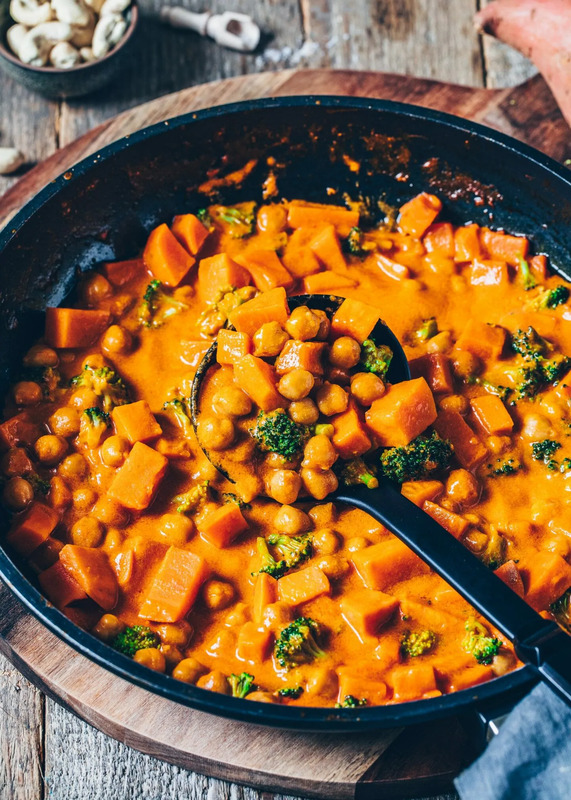 I love anything with sweet potato, but curry must be my favourite way to eat it! Your version looks so delicious Bianca! Great job, as always! It sounds very convincing to me and I consider buying the recommended products. What do you say about that? Tried this curry last night and it was incredible! Seriously, I could eat it everyday!! It was sweet and savory at the same time, and hearty enough to satisfy the biggest appetite. Try it!! Super good! Hearty and sooooo tasty! So glad that you liked it 🙂 Thank you!